This is a very small spider so the pictures are heavily cropped. It is about 5mm in body length and has very unusual markings. Maybe someone know what kinds it might be. I would almost guess a Black Widow. Last year I found one in a place that I would have not expected to find a Black Widow, in an open field with its web strung between some tall blades or stems of grass. Usually I expect to find them under old boards and in barns and such but looking into them, the Black Widows, I found some that were not all black and had very beautiful markings, such as the one you have posted here. Not saying it is a Black Widow but it favors one. Creepy shot from my "phobic" point of view but very well taken. Thanks Ken. First, you have taught me something as I have always thought Black widows are black with a red spot. I did not know they came in different colours. Secondly, I hope it is not one as this nest is on the gatejust outside my office door!! It is definitely a widow of some sort no idea what species though. Males and juveniles are often multicolored as this one is, in some species the females remain this way as well. This would be a juvenile, not a male. Thanks for this interesting information Gordon. I have looked on the few sites we have here and there is nothing even like it on any of them so I cannot find a proper name but I will keep on searching. At least I have a species to look for now. I have found this site which has some on them and have e-mailed them with my pictures to see if they can give me more information. 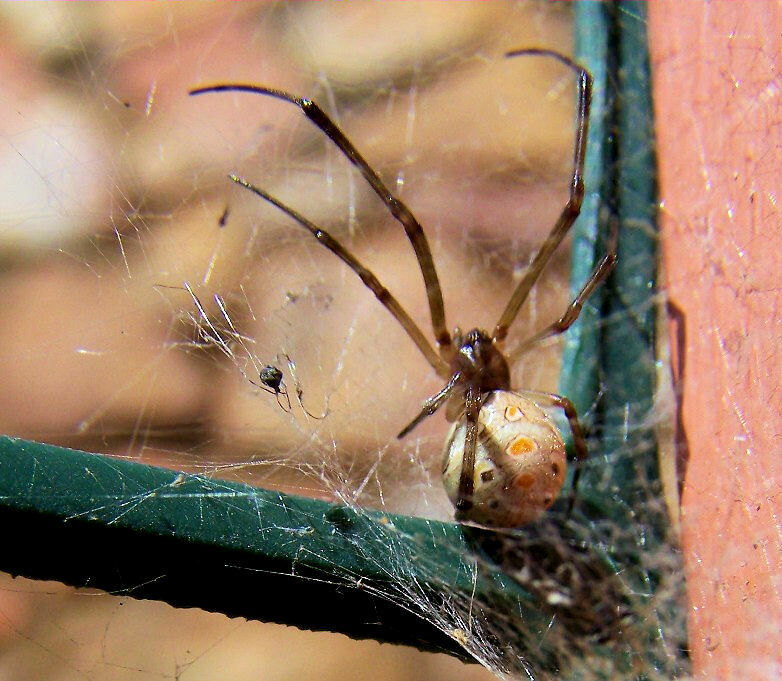 Someone has just given me an identity on this one: Brown Widow Latrodectus geometricus. 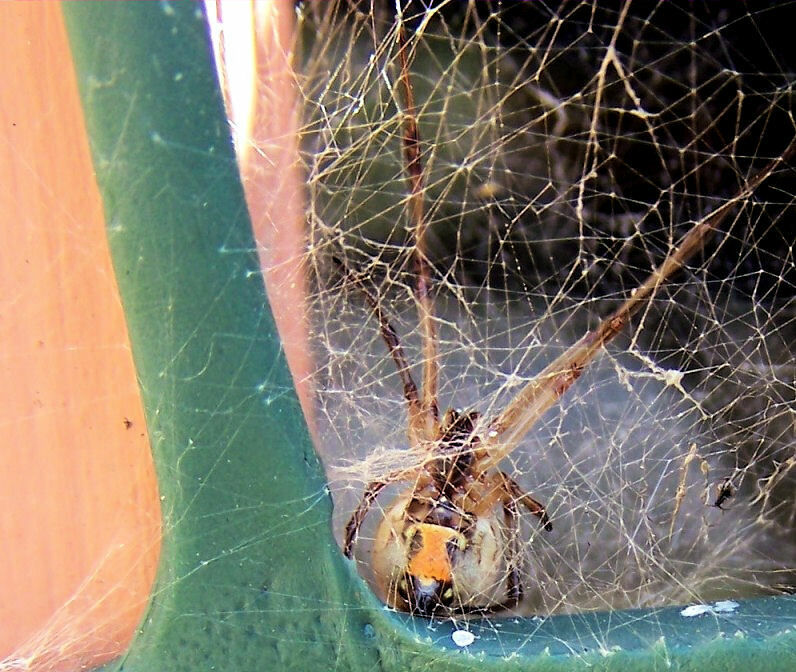 Maybe all the pictures are changing your mind and we will get you to like spiders eventually. I could not find the reference to the frogs...maybe if you can find it again, you could let me have it? It sounds interesting but unbelieveable as these spiders are VERY small. My goodness!! What an interesting series of photographs Ken. Thank you so much for the link. I would not belive it would go after a frog.....the frog is bigger than he is!! But I guess wrapped up, it will be enough food for a whole lot of little ones.